Mitch Englander – Political & Current Affairs Blog Published by Celeste Greig. Liberals and Progressives who want to undermine and restrict our 2nd Amendment rights know it’s harder to go after the guns themselves than the bullets and the magazines. Our rights are slowly eroded in Sacramento and in our local government and most won’t notice until it’s too late. The arrogant will say you should be able to defend yourself with a maximum of six rounds. Easy for liberal politicians to say when they won’t be standing in your shoes if you are unfortunate enough to have to defend your life or the life of a family member. Unanimous? So much for the Republican on the council. Defying the warnings of gun rights groups, the Los Angeles City Council voted unanimously Tuesday to ban the possession of firearm magazines that can hold more than 10 rounds. Backers of the plan said it would help minimize the bloodshed of mass shootings by forcing attackers to interrupt their rampages to stop and reload. Juliet Leftwich, legal director for the Law Center to Prevent Gun Violence, called such magazines “the common thread” in almost all of the mass shootings that have devastated the country, from Newtown to Virginia Tech to Columbine. Even as city officials celebrated the newly passed restrictions, gun control activists were dismayed to hear about a proposal to exempt some retired police officers from the rules — an 11th-hour change now being sought by the union that represents Los Angeles police. California law already generally bans the manufacturing of such large-capacity magazines, offering them up for sale or bringing them into the state. But state law does not prohibit people from possessing them — something that Councilman Paul Krekorian and others called a loophole that jeopardizes public safety. 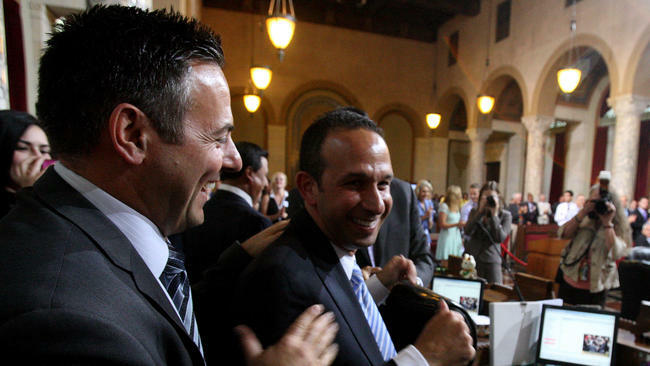 Los Angeles lawmakers first sought to draft such rules more than two years ago. Survivors of gun violence lamented that it had taken so long for the council to press forward with the ban. Rhonda Foster, whose 7-year-old son, Evan, was killed and her younger son, Alec, injured when a gunman sprayed their car with more than a dozen bullets, said the ban would save lives. “This is a no-brainer,” her husband, Ruett Foster, told the crowd, holding a picture of his sons. The National Rifle Assn. and other gun rights groups have threatened to sue over the new Los Angeles rules, arguing that they violate the 2nd Amendment and are preempted by California law. CalGuns Shooting Sports Assn. has also raised concerns. “I don’t think it’s going to have any effect on gun violence,” said association director Chad Cheung, pointing out that someone in neighboring cities such as Burbank or Glendale could still possess the magazines. Under the new rules, Angelenos will have 60 days to remove, surrender or legally sell or transfer them after the city ordinance goes into effect. Breaking the law will be a misdemeanor. The Los Angeles rules exempt, among others, on-duty police and military gun owners, licensed firearm dealers, and people who more than 15 years ago obtained guns that only can be used with such magazines. At the Tuesday meeting, Councilman Mitch Englander also proposed an exemption for any retired police officer who holds a valid, current permit to carry a concealed weapon. Peter Repovich, director of the Los Angeles Police Protective League, said it was important for police — including retirees — to be prepared to meet any threat to public safety. “They’re additional eyes and ears out there,” Repovich said. The Council also voted narrowly to ask city lawyers to draft such an amendment, which will return to the council for debate and a vote next week. Four council members — Paul Koretz, Nury Martinez, David Ryu and Marqueece Harris-Dawson — voted against drafting the amendment, which was sharply opposed by gun control activists. “If the City Council allows this exemption, none of us are going to be happy,” said Women Against Gun Violence Executive Director Margot Bennett. The police union has also pushed for retired officers to be exempt from another proposed ordinance that would require Angelenos to lock up handguns or disable them with a trigger lock when they are not being used at home, a measure meant to prevent deadly accidents. Krekorian has balked at that idea. “If they don’t store their gun in a safe way, that gun is a hazard,” the councilman said. However, Krekorian said he supported exempting retired officers from the magazine rules because it wouldn’t pose a similar risk to the public.